Grampa’s favorite comfy red chair is more than it seems. With just a pinch of imagination, it transforms into a raft, an airplane, or even a ­magic ­carpet, and whisks you off to distant lands! Search for pirate ­treasure, explore a coral reef, and soar above the clouds in this delightful tale. 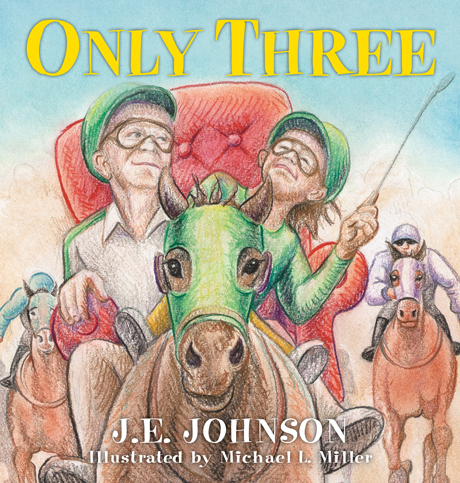 Only Three is a classic story of childhood wonder and adventure. It reminds us that anything is ­possible when you use your imagination! J.E. Johnson is a university emeritus professor who has greatly enjoyed his retirement, especially the opportunity to travel with his wife and spend time with their family. They live in southeastern Pennsylvania. Michael L. Miller studied Communication Design at Kutztown University. After working in the graphic design world for a few years, he decided this was not the path for him, and returned to Kutztown to earn his teacher’s certification. Today, he enjoys teaching art to children in the Wyomissing Area School District, and has taught art for over twenty years. During that time, he has earned his MFA from Maryland Institute in Baltimore, Maryland, and also coordinated over three dozen public art projects in Reading, Pennsylvania.